Some spouses who are married to men with Asperger’s do indeed experience a significant amount of dissatisfaction in their marriage. Not everyone reacts similarly, nor do all couples experience the full range of potential problems. Being in a marriage to a spouse on the autism spectrum affects the relationship in a number of ways, most notably in the areas of emotional “give-and-take” and communication. Incorrect assumptions (due to the mind-blindness phenomenon) made by the “Aspie” often lead to self-protective strategies that include distancing himself entirely – and then not responding at all to his spouse. An emphasis by the so-called “neurotypical” (i.e., non-autistic) spouse on expressing feelings is likely to lead to frustration and disappointment. In the beginning stages of the marriage, the neurotypical spouse may be O.K. with doing most of the “emotional work” of the relationship. But, once children arrive, further problems may come about as the Asperger’s father has difficulty effectively engaging and empathizing with his children. If the wife expresses frustration at this lack of affection and intimacy, her Asperger’s husband is often puzzled by the complaint. Thus, arguments and discontent may result. Asperger’s is a lifelong developmental disorder, and usually manifests in the inability to successfully relate emotionally to others during everyday interactions. A lack of awareness in interpreting social cues manifests itself. 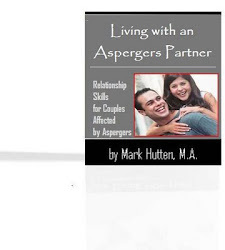 Given that inability, it can be very problematic for the wife of a person with Asperger’s to cope with many of the behavior patterns typically exhibited. If the husband exhibits many – or most – of the traits associated with Asperger’s, but is undiagnosed, it can be particularly frustrating and demoralizing for his wife. She may even blame herself for the decline in the relationship (e.g., “I’m not attractive to him anymore”). Once an effective diagnosis is made, at least there is some understanding for the wife as to why her husband behaves the way that he does. When a spouse is diagnosed with Asperger’s as a result of the child within the family being diagnosed, it can come as a "double whammy" to the wife. This is particularly the case when the father and child are diagnosed at the same time, because the woman is now in the position of dealing with two family members affected by an autism spectrum disorder. The difficulties in understanding the emotions of others and interpreting subtle communication skills (e.g., eye contact, facial expressions, body language, etc.) often leads to the wife’s perception that her husband is simply being rude, uncaring, cold and selfish. While this is understandable for her to feel this way, it is a false assumption. Asperger’s is a genetic, neurological condition that renders the affected person mentally unable to readily understand and interpret the emotional states of others. Unfortunately, even when diagnosis occurs, some Asperger’s spouses refuse to go into therapy or accept available assistance, because they don’t believe that they have a problem. One woman that I counseled had a husband with the disorder and was relieved to finally discover the reason for his emotional aloofness, but was devastated when he refused to go to counseling. He simply asserted, "There's nothing wrong with me!" So, one does not have to stretch his or her imagination very far to see why some women married to men on the spectrum are at their wits-end. Are there any options for the neurotypical wife other than (a) staying in the relationship and accepting her partner for who he is, (b) staying in the relationship and continuing to try to “fix” her man, or (c) leaving the relationship? Fortunately, couples counseling (preferably by a therapist who has some expertise in working with clients on the spectrum) can help. Also, there are many support groups – both online and off – where these women can go for advice and encouragement -- and to simply vent their hurt and anger over the situation. • Anonymous said… If you can't handle being in a relationship with an Aspie, that's on you. You knew what you were getting into even before you got married. • Anonymous said… Not always. It's now clear my dad is autistic but he would never seek a diagnosis. I didn't know I was till my daughter was diagnosed so my husband had no idea either. • Anonymous said… Exactly, I didn't know the reasons behind my husband's behavior until my daughter was diagnosed and then he got the diagnosis. And no one knows what they're "getting into" with anyone (diagnosis or not), people have different experiences before and after living together. • Anonymous said… Past generations did not look for ASD kids. If u were diagnosed; you kept it a secret. It wasn't until the TV show "Big Bang Theory" & the acknowledgment of "nerd" intelligence, that ASD people came out of the shadows. Most people over 40 now, had no clue that they or their spouse are on the spectrum. The baby boomer generation was surprised by ASD. • Anonymous said… It's a very difficult path in a marriage....it's sad for everyone involved. • Anonymous said… No, often they have no idea!! • Anonymous said… I know two who kept it a secret. • Anonymous said… Wow such compassion. And no, many of us did not. And once children are born and lives entangled things aren't so black and white. • Anonymous said… Because Hollywood promised us a "happily ever after" But it turns out to be lots and lots of lonely work sometimes. • Anonymous said… I did not know, and am still undiagnosed. But we think my wife is aspie, too. • Anonymous said… Aspurbugers doesn't have to be genetic . I am an aspie. My son does not have it at all. Seems like this is only a problem in a marriage where the husband is the aspie. I don't have that issue. My husband is an RN very understand . Also has some ADHD himself so not completely Nero typical himself. In fact it insults him when I call him a Nero typical when I get made at him. • Anonymous said… Because they take too many little things personal. Your husband has a medical issue, much like epilepsy, he can't control some aspects. If you wouldn't get pissed off at an epileptic having a seizure, you shouldn't get upset by you significant other having an Aspi lapse. Learn more, pay attention more, love me. • Anonymous said… This is exactly what the past 19 years has looked like. We're both getting counciling, and it is helping us understand our differences. Yesterday we were able to talk through a huge misunderstanding without a meltdown. A couple light bulbs went off in his head. He didn't realize that celebrating our anniversary was a big deal compared to a date night. He also realized that starting out first thing in the morning acknowledging the milestone is huge for me. We celebrated 19 years yesterday! The day ended well with a lovely dinner after we communicated to each other how we saw the day (it wasn't an easy talk). We were able to enjoy the evening after that, and it kept us (mostly me) from being hurt further. He said 20 years is a big anniversary so he will be planning ahead.